The wonderful Monterosso Kaftan from Antica Sartoria Positano makes for the perfect summer dress. Ideal in the daytime for the beach look, but also in the evening for a poolside dinner or a walk along the seafront. Light, cool and above all comfortable, without closures, zippers or buttons, the caftan slips quickly from the head, but at the same time gives elegance and charm to the wearer, allowing you to face the hot summer days with class and charm. With a bright color print of an Italian resort town and an intricate neckline, this floor sweeping kaftan dress will make every trip a standout. The Monterosso Kaftan makes for the perfect dress for any occasion. 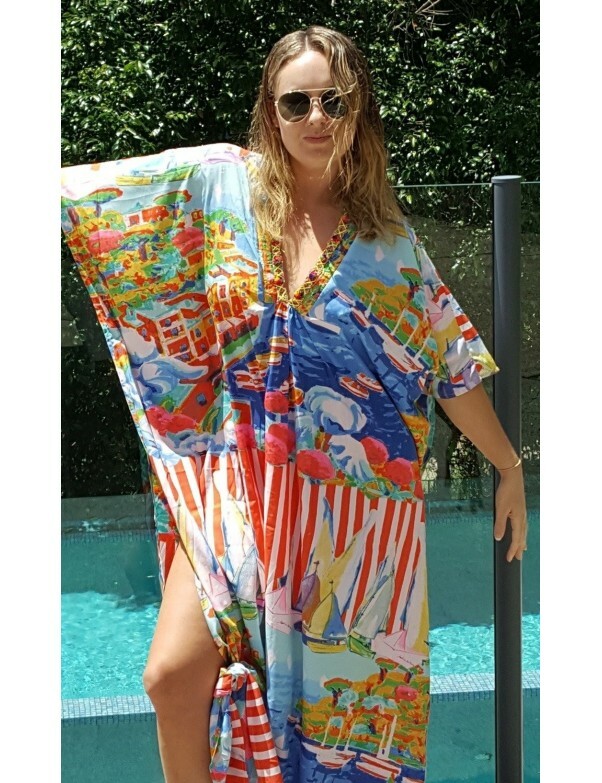 With a bright color print of an Italian resort town and an intricate neckline, this floor sweeping kaftan dress will make every trip a standout.